We’ll just start out with some snowy images, because spring is late this year. 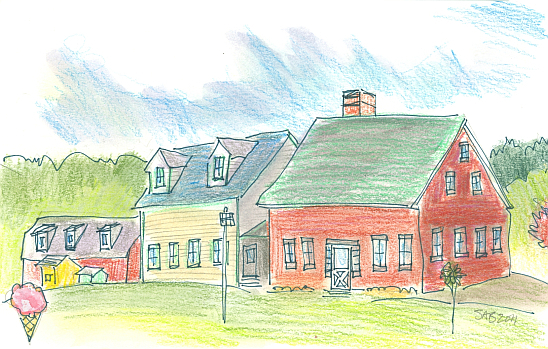 I drew this last week while sitting in the Cleveland Library on the campus of Colby-Sawyer College, here in New London, NH. The only color I could see on this overcast day was the dried plant stalks of last year’s experimental garden. Mount Sunapee is in the distance. The metal buckets are attached to the maple trees for collecting sap. It is boiled down into syrup in a sugar house on campus. We have a lot of wood clapboarded buildings in New England, but many red brick ones too. Here are four. 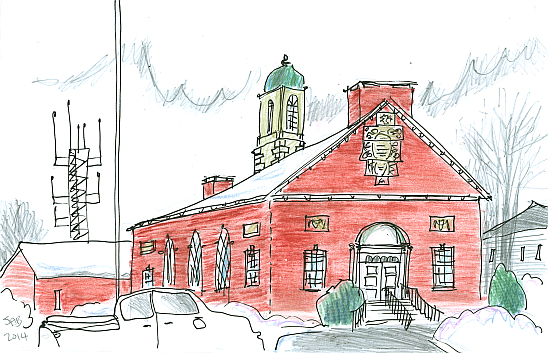 This is New London’s town hall, called Whipple Hall, on Main Street next to the town common. It was built in 1918. It is beautiful inside with tall windows and a stage, and used for many functions...like voting, plays, concerts, flower shows, and as the local courthouse. It is not large enough any more to hold the annual town meeting, as the town’s population has grown to over 4,000 inhabitants. The town meeting is now in a school gymnasium. The front façade and west side have five bas-relief sculptures Some day I am going back with my binoculars to see it better. Four of them have fabric draped cow skulls carved onto placards. The police department is in the rear, thus the antenna tower. Old Glory sits atop the tall flagpole, off the top of the drawing. Last weekend we took a drive to nearby Woodstock, Vermont, which is the county seat of Windsor County. And here is the Windsor County Courthouse, 1855. 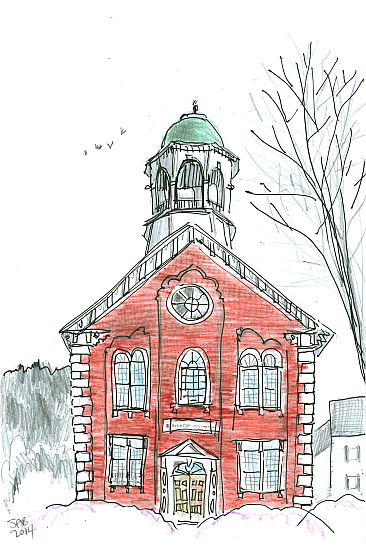 Woodstock is full of fascinating architecture, well worthy of a drawing session. The day was cold and I drew this from inside the car. Piles of snow are fun to draw. Another brick building, but in another season. The glorious fall season, as we call it. Some call it autumn. 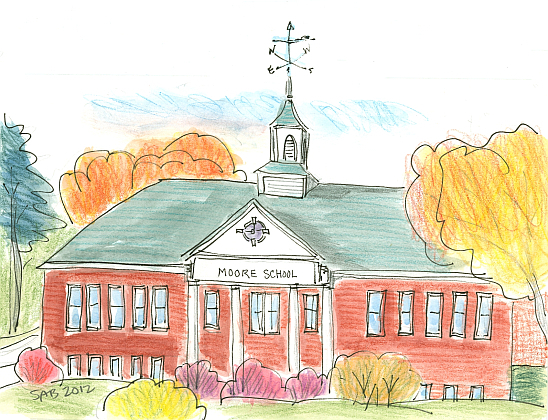 The Moore School is in Candia, New Hampshire, just east of Manchester. The school goes from kindergarten through 8th grade. The Brick Farm, an ice cream business in Unity, New Hampshire. The wooden ice cream cone sign is simple and effective. We’ve had a lot of storms and stay-inside days. Here is a little parade of cups I laid out one day to draw. ‘Wicked’ is New England slang meaning ‘very’. The cat letter opener was carefully painted in Venice. The middle cup is from Bavaria, and the one on the right is from Tim Hortons donut chain in Canada. 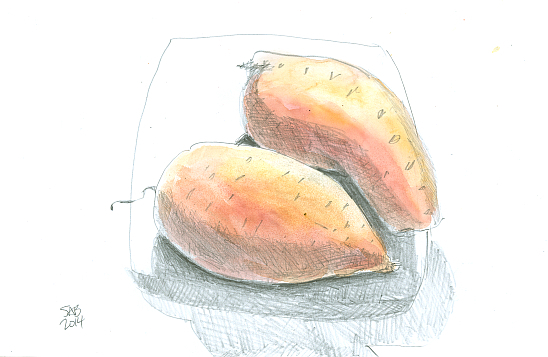 I don’t remember why I decided to draw two sweet potatoes. Probably because I had never drawn them before, and because I was about to cook them for supper. I never saw sweet potatoes when growing up. Only southerners ate them. Here's some news from my world. 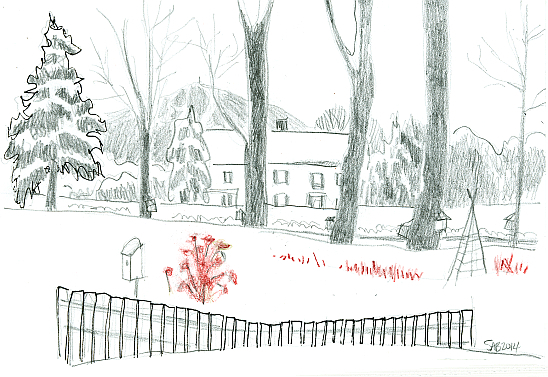 I will again be teaching a class in drawing at Colby-Sawyer college here in New London, starting on April 25th. The class is sponsored by their Adventures In Learning program, an adult education undertaking. Last summer my class was called Colorful Journey, and it involved walking around the college campus and drawing on location. 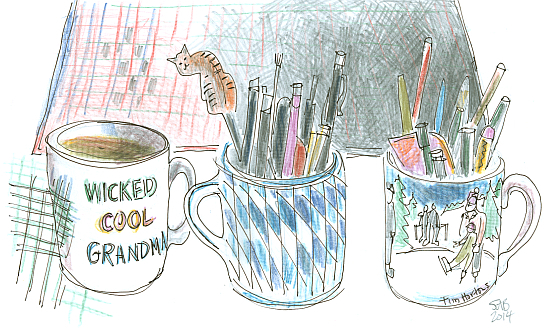 This year, the class is called Drawing On your Memories, an indoor class of still life subjects. We will also explore adding written journal-like writings in the composition too. It will be fun to see some students from last summer, as well as welcome new faces too. Class size is limited, so check out the catalog soon if you would like to find out more.